until approx the 1850s to kindle a new pure fire which has been referred as Live Fire, Wild Fire, Neid Fire, Force Fire, Tein'-éigin, Notfeuer, Nodfyr, Nedfris, Nedfres, священного живого Огня (Sacred Living Fire). A new pure fire would be kindled either at times of distress (e.g. outbreak of disease) or at auspicious times of the year e.g. Beltaine or Samhain. My fascination isn’t just on the practical level (which this page focuses on) but also the symbolism and spiritualism of these rituals and the communal extinguishing and relighting of hearth fires; and the importance of the community coming together at times of distress (I may explore this further in a blog post at some point.) The practicalities is just one aspect. The tradition of these fires apparently may date (there is no proof, only speculation) back to approximately the age of the Celts & Slavs \ Iron Age (somewhere from 600BC onwards ) throughout Europe\Russia . It does seem that they were in use during the Middle Ages as apparently there is historical evidence in the 7th and 8th centuries that attempts were made to ban the Neid Fire practices by the Church (see further below) I have found various written accounts by various writers from the 17th century onwards : Johannes Reiske (German educator and historian 1641 - 1701) wrote Not Feuer in 1696; Sir James Frazer (Anthropologist 1854 to 1941 author of "The Golden Bough" ) describes the Fire rituals of Europe and Fire Churns; Martin Martin (Màrtainn Màrtainn dod 1718 author of A Description of the Western Islands of Scotland 1703); Alexander Carmichael (folklorist 1832-1912 author of Carmina Gadelica, a compendium of Highland lore and literature . ); Curiosities of Indo-European Tradition and Folk-lore by Walter Keating Kelly 1863. There is also evidence of Fire Gates in Russia where they are called огненные ворота (Fire Gate) and are still used today. ​Based on the various writingsand references, it does seem that it was indeed a practice but there is no way of knowing how far back it dates. Chapter II is very interesting as it talks about Sacred Fire, Fire Churning (in India and Europe) and Neid Fires. I've found a free on-line version here. Chapter II can be found from page 37 onwards. It's interesting as Walter talks alot about other contraptions being used to produce the fire such as cart wheels and horizontal fire churns - as well as the fire churn's I've pictured on this page. The extract to the left is also intriguing as it states that the earliest account of the Neid fire in England is from 1268 documented in the Chronicle of Lanercost. ​There is an ebook of the Lanercost Chronicles here but it's mostly in latin and I've not found a translation for the year 1268, so currently I can only go on Walter Kelly's assumption. In all instances (and it seems cultures) of kindling the new pure fire using the Fire Churn, all fires within the local community would be extinguished . Once the new fire had been kindled and offerings made, then everyone in the community would light their fires from the new communal fire. In the case of curing ills, damp wood would be added to make copius amounts of smoke and the cattle\people would be paraded through the smoke to "cleanse" them. or in other accounts water is boiled on the fire and then sprinkled over the people\animales. The community would also take a brand from the fire and re-light their hearth fires after the ceremony. It seems different communities would have slightly different rituals, requiring a certain amount of people involved in making the fire, or the fire having to be made in a particular way depending on local beliefs and superstitions e.g. 9 times 9 first begotten sons. It seems this tradition occurred as recent as until the early to mid 1800s in the highlands of Scotland, and the Fire Gates are still very much used in Russia. In the city of Vologda in Feb 2017, the city administration organised lighting of the Sacred Living Fire "священного живого Огня" using the Fire Gate - see photo to the left and click on photo for the Russian article. 12-Oct-18 - update: Henry Cowper references the banning of the Nedfri in 742 by the Synodus Francisca in his book "Hawkshead (the northenmost parish of Lancashire)" 1899 (see further below) which is very interesting. ​It is also interesting to note that the Church turned the "pagan" fire festivals into Christian festivals such as St John's fires (Easter fires) - e.g. the Slavic Ivan Kupala festival is now celebrated as the Feast of St John the Baptist. 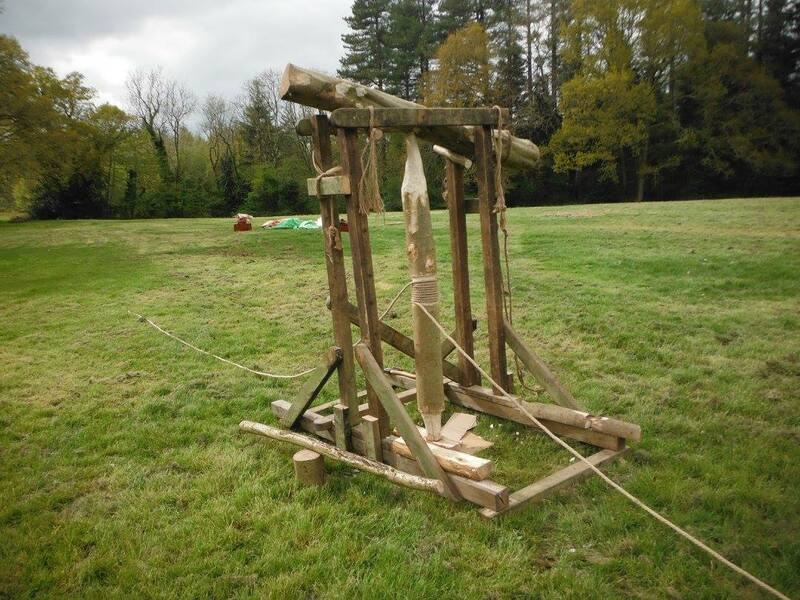 A simple fire churn built in my back garden! (Sept 2018) It works really well! ​According to many descriptions, the traditional Neid Fire / Force Fire method was apparently a large “fire churn” apparatus employing friction fire. In Russia this is also called a Fire Gate. The apparatus would consist of a large wooden frame to support a large heavy cross bar of hard-wood which would have a hole made in the centre (I suggest forcing a smooth round flat stone into the hole to help reduce friction at the top.) A large hearth log would be placed at the base with a shallow hole carved and with a notch (similar to bow drill hearths but on a larger scale.) A straight log about 6 feet tall, and up to about a foot in diameter sometimes referred to as the auger ( spindle) would be carved at each end with a narrow point at the top and a more shallower point at the bottom but you would still want the bottom to be quite narrow as otherwise it may be quite difficult to gain enough friction to produce an ember. The auger would be placed vertically between the cross bar and hearth. The auger would need to be carved as straight as possible and would need to be placed as vertical as possible. A long heavy rope would be tightly wrapped several times around the middle of the auger (it would help to carve a narrower section in the middle ) with an end of the rope on opposite sides and this would be pulled with force and speed in turns by a group at each end of the rope to create friction. The rope would need to be kept tight at all times According to some folklore, nine nines of first begotten son’s were required to pull the rope to “churn” the auger into the hearth log! I have also read descriptions of slightly different apparatus including spinning wheels, cart wheels, and augers being horizontally driven into wood - though I'm unsure how that would work and am suspicious of those written accounts about the horizontal churn. I have tried a horizontal churn and due to the nature of friction, it is very difficult to achieve the necessary pressure and friction horizontally. I'm also intrigued by the use of wheels and will have to try them one day! My reconstruction of a Fire Churn (May 2018) which works beautifully. Force Fire an art installation used to start the Helmsdale Highland Games in 2015 by the artist Tim Knowles. (The perspective makes it look a lot larger that it actually was! See video further below.) Click photo to go to Tim Knowles Force Fire web page. 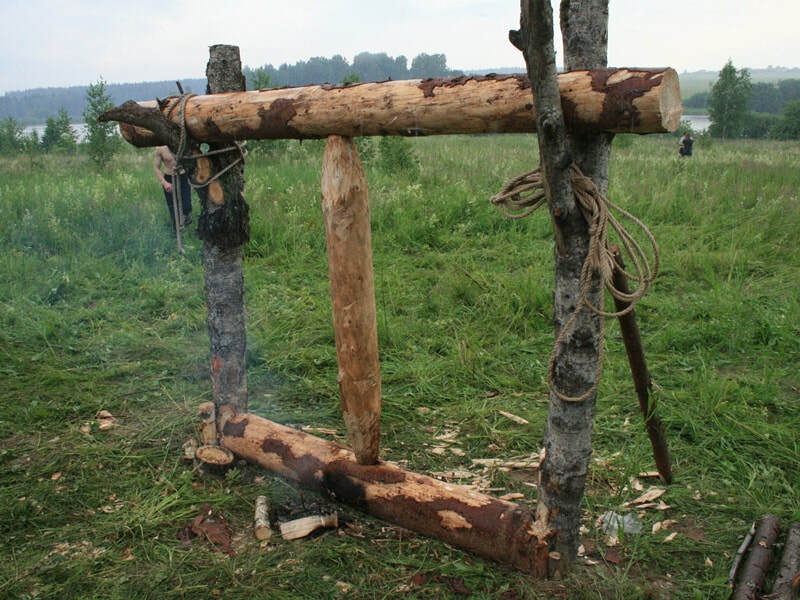 A Slavic Fire Churn reconstruction at an Ivan Kupala festival. Click photo to be taken to an interesting article. 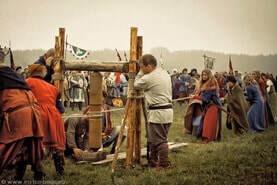 A "Force Fire" churn being used as part of a ceremony by a Viking re-enactment group in Poland in 2013. Photo by www.fotoforge.eu. Click photo for more photos of this ceremony by FotoForge. I will add to this section over time as I discover new references to the history and folklore of these devices. At the moment, this page is a bit scrappy and more of a collection of references for me to follow up on. ​The Beltane (then later Samhain) Fire Festival was re-established in Edinburgh in 1988 which saw the estabishment of the Beltane Fire Society who organise the Beltane and Samhaain Fire Festivals in Edinburgh. They light the starting "Neid fire" with the bow drill, all other torches and fires are lit from this new fire. In Ireland there is the Samhain Fire Festival which takes place at Tlachtga on 31st October. Some think Samhain originated at Tlachtga (Hill of Ward) more than 2,000 years ago. In Russia , the fire churns still seem to be used and I have come across quite a few photos and articles of re-enactments. I have started some research into the references mentioned in the Carmina Cadelica (see below.) Although I've not yet found much to substantiate it - I have found some interesting info relating to the references to North Uist (a Scottish Island) where apparently Neid Fires were lit. I found a reference in the Inverness-shire OS Name Books, 1876-1878 (click link for an image of the original record) of the place name Skellor \ Cladh Sgealoir in Sollas on the Island of North Uist . The transcription reads as "This name is applied to an ancient burying place, situated 30 chains north from the farm house called Dunskellor. It is a sandy knoll and a number of graves and rude stones are to be seen on the summit. Recently, a quantity of ashes and [word cut off by fold] which appeared to have been used in ...ding [part of word cut off by fold] were exposed at this burying place by the wind having moved the sand which covered them. Actorway (? word hard to decipher?) is said to have been buried here." It is a shame that some words had been cut-off .... is this the Sandy Knoll where the Neid Fires were performed and are the aforementioned remains of ashes the remains of a Neid Fire in Sollas, as described in the Carmina Cadelica?? Sollas is a small crofting village in North Uist and there are various records of sites of interest such as the Sgealoir Burial Ground and remains of roundhouse\fort etc. ​I have not found any reference to the sandy plain Sail Dharaich, in Sollas, which was apparently named after the Oak Log used in the Neid Fires - but looking at the OS map there are various strips of sand there, and Sgealoir is next to dunes, so who knows! Here are some of the references \ articles \ research material I've found on Neid Fires - I'm happy to list them here. If you do find them useful and use them then an acknowledgement would be nice as some of them took a bit of digging to find! This is a very interesting and good article about Neid Fires in Cumbria\England by Diane McIlmoyle . I need to follow up on the references, and I do credit\acknowledge Diane for the time she spent writing and researching her article on Neid Fires. These are the first references I've seen of Neid Fires in England. What a marvelous book! I need to find time to read more of it! This is a recent article from Oct 2018 which is well written and pulls together a lot of the references and research that I list on this page, plus a couple that I'm not familiar with, and it summarises the Neid Fire practices nice and succinctly. This quote was intriguing "In 1649 , the Synod of Moray rules that raisers of needfire in the Presbytery of Strathbogie had to wear the sackcloth for three days." I've yet to find time to read it but it has chapters on Fire Festivals and Neid Fires! Sir James Frazer writes a lot about Neid Fires of Europe and Scotland within the Golden Bough - see below for a link to the relevant chapters in an online version. Although, I am a little dubious of some of his references and theories. L-Wyl is The Entymological Dictionary of The Scottish Language (1806) which includes a definition of Neid Fyr, simply "The fire produced by the friction of two pieces of wood". Click here for more info. "teine-éiginn - Fire by friction, forced fire or fire of necessity. The teine-éiginn was considered an antidote against the plague and murrain and all infectious diseases among cattle. Dr. Martin says all the fires in the parish were extinguished and 81 married men, being deemed the proper number for effecting this purpose, took two planks of wood and nine of them were employed by turns, who by their repeated efforts, rubbed the planks against each other, till the heat thereof produced fire and from this forced fire each family was supplied with a new fire. No sooner was the fire kindled than a pot filled with water was put thereon, which was afterwards sprinkled on people who had the plague or on cattle that had the murrain, and this process was said to be followed invariably by success — **. A term applied to fire produced by friction — in olden times a means employed to check evils arising from being bewitched. If a household suffered loss such as indicated being under evil influence, all fires in the district between two running streams were extinguished on a set day. Then a spinning-wheel was put in motion and kept going furiously until the spindle became heated. Tinder or tow was applied to the hot spindle, fire was thus procured and distributed to all households affected by evil influences. Within the memory of persons still living, fire was thus procured to check witchcraft in a township in Uist where some sickness, supposed to be evil eye, carried off some cows and sheep. It is odd that neither cow nor sheep died after, possibly the epidemic had exhausted itself — DC. Last made in N. Uist about 1829, in Arran about 1820, in Helmsdale about 1818 and in Reay about 1830 — AC." ​BEALLTAIN, Beltane, is the first day of May. On May Day all the fires of the district were extinguished and 'tein eigin,' need-fire, produced on the knoll. This fire was divided in two, and people and cattle rushed through for purification and safeguarding against 'ealtraigh agus dosgaidh,' mischance and murrain, during the year. The people obtained fires for their homes from this need-fire. The practice of producing the need-fire came down in the Highlands and Islands to the first quarter of this century. The writer found traces of it in such distant places as Arran, Dist, and Sutherland. In 1895 a woman [p. 183] in Arran said that in the time of her father the people made the need-fire on the knoll, and then rushed home and brought out their 'creatairean,' creatures, and put them round the fire to safeguard them, 'bho 'n bhana bhuitsich mhoir Nic-creafain,' from the arch-witch Crawford. The ordeal of passing through the fires gave rise to a proverb which I heard used by an old man in Lewis in 1873:--'A Mhoire! mhicean, bu dora dhomhsa sin a dheanamh dhuit na dhol eadar dha theine mhoir Bheaill,' Ah Mary! sonnie, it were worse for me to do that for thee, than to pass between the two great fires of Beall. p.333 In North Uist there is a sandy plain called 'Sail Dharaich,' Oak-log. A beam of oak lay there, from which the people produced the 'tein-eigin,' neid-fire. This was done by 'naoi naoinear ciad ginealach mac,' nine nines of first-begotten sons, these being in the estimation of the people the most sacred and enduring. Tein-eigin, neid-fire, need-fire, forced fire, fire produced by the friction of wood or iron against wood. The writer conversed with several persons who saw the neid-fire made, and who joined in the ceremony. As mentioned elsewhere, a woman in Arran said that her father, and the other men of the townland, made the neid-fire on the knoll on 'La buidhe Bealltain'--Yellow Day of Beltane. They fed the fire from 'cuaile mor conaidh caoin'--great bundles of sacred faggots brought to the knoll on Beltane Eve. When the sacred fire became kindled, the people rushed home and brought their herds and drove them through and round the fire of purification, to sain them from the 'bana bhuitseach mhor Nic Creafain,'--the great arch witch daughter Cranford, Mac Creafain, now Crawford. Mr Alexander Mackay, Edinburgh, a native of Reay, Sutherland, says:--'My father was the skipper of a fishing crew. Before beginning operations for the season, the crew of the boat met at night in our house to settle accounts for the past, and to plan operations for the new season. My mother and the rest of us were sent to bed. I lay in the kitchen, and was listening and watching, though they thought I was asleep. After the men had settled their past affairs and future plans, they put out the fire on the hearth, not a spark being allowed to live. They then rubbed two pieces of wood one against another so rapidly as to produce fire, the men joining in one after the other, and working with the utmost energy and never allowing the friction to relax. From this friction-fire they rekindled the fire on the hearth, from which all the men present carried away a kindling to their own homes. Saint John's Eve, is the eve of celebration before the Feast Day of Saint John the Baptist. The Gospel of Luke (Luke 1:36, 56–57) states that John was born about six months before Jesus; therefore, the feast of John the Baptist was fixed on 24 June, six months before Christmas Eve. This feast day is one of the very few saints' days which commemorates the anniversary of the birth, rather than the death, of the saint being honored. Emergency Fire (old German Nodfyr , Wild Fire - in the true sense of real fire. The lightning bolt and thereby caused the fire, still alive in the Styrian dialect wildfire was also the term for passion), in Germanic antiquity that used to religious use and for medicinal purposes Fire , which had to be recreated by friction of two woods according to the method of natural peoples. Both the Easter and woodcock fire, as well as those through which the sick cattle were driven, had to be produced in accordance with the previous extinction of all burning fires in the village.it was the uncontrolled wild fire of the year 1813, which at that time was still burning. This wild fire flashed, a fire that indicated the hoard of the sunken folk. Heinrich Pröhle (1822-1895) By the way, custom was already found in ancient India and passed to Greeks and Romans, in whom the fire of the Vesta on a particular day of the year (as later the Easter fire), or when it had been extinguished by negligence, was thus produced as well as that through which the herds of cattle were driven at the shepherd's feast of the Paliles in Rome. The custom has been maintained the longest in Thuringia and the Harz, where 1842 and later (in the region of Quedlinburg), officials were officially ordered by the local mayor to kindle emergency fire to protect the pigs against anthrax. Translated by Google Translate. Note: Author\source unknown. 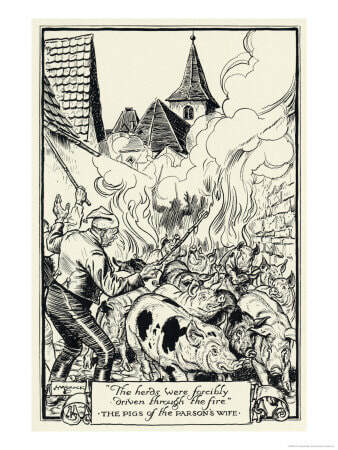 Illustration by H M Brock (1875 - 1960) British Illustrator "At Quedlinburg Germany sick pigs are driven through the NOT FEUER literally the need fire"
Historian Johannes Reiske (German educator and historian 1641 - 1701) wrote Not Feuer , published in 1696 , which apparently was considered a pioneering achievement. Kurtze so wohl historische, als vernunfftmässige Untersuchung desbeym alten Teutschen gebräuchlichen Heydnischem Nodfyrs und desdaher aufgekommenen heutigen Nothfeurs ... Benebenst einem Anhange J. Timei (von Oster. Feuer.). 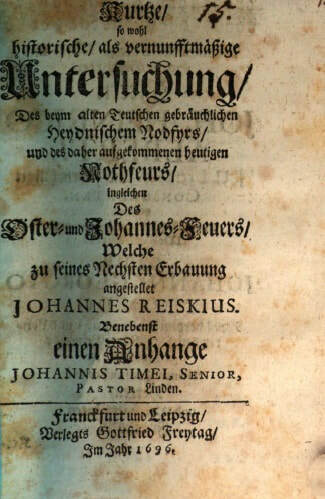 Loosely translates as: "Reiske, Johann: Kurt so well a historical, as an ingenious investigation, the Heydnian Nodfyr, used in the old Teutschen, and the present emergency , as well as of the Easter and St. John fire, which was placed at his next edifice, Johannes Reiskius, Frankfurt et al., 1696"
Representations about the annual renewal of the fire are due to the rites of burning the Living Fire on certain days and calendar holidays . For Bulgarians, the replacement of the "old" fire with a new one, obtained by friction, is carried out on the Goryshchnik ( in Bulgarian ) , in some regions - on the eve of Ivanov's Day (Enovden, Varna ), on St. Jeremiah (1.V) (SJ- Rhodope ), in the New Year (Hasvah. ), On the day of St. George (Wed- Rhodope ), on Christmas Eve , the day of St. Panteleimon (27.VII). In the Eastern Slavs, the rite of collective ignition of the Living Fire took place on the eve of the Seminary of the Letnorodets on the first of September (i.e., at the beginning of the new year according to the pre-Petrine calendar) or on Ivan Kupala : from the Living Fire, the campfire was lit, and the cattle were jumped over and overtaken. The Hutsuls watched the holy fire that had been caught on Christmas Eve and spread through the huts throughout the year, preventing it from going out. The Poles, with the help of this fire, fired a large rural fire on Good Saturday, his flame was consecrated, and people carried home smoldering bunches. With the idea of ​​renewing the life force, the symbol of which is the "new" fire, the rituals of burning the Living Fire in a new house are connected, when the village is moved from one place to another (especially in case of an epidemic). "A special sacred power was attributed to Fire, which was obtained by the most primitive way - friction. And here, perhaps, I should say a few words, why all the ancient used such honor, and even nowadays it uses: the best advertisement is "made according to ancient recipes". The fact is that all the most ancient customs, methods and crooks, it was believed, the forefathers and foremothers of living people now learned directly from the Gods. Let us recall the blacksmith's pliers and plow, "fallen from heaven", or "first" laws! Accordingly, all subsequent technical and social progress was partly a distortion of the great-grandfather's "divine" wisdom, above which, according to ancient people, nothing could be. So, the fire, obtained by friction, was considered "clean", not in contact with any nasty things. With the ignition of such a Fire, the New Year was celebrated every time. At the same time, it was believed that all the sins of the past remain with the old fire that was extinguished: thus, every year the world is given a chance to reborn, to become kinder and better ... Let's note in passing that the beginning of the new year in Russia was repeatedly postponed, it was celebrated in March , then in September, but one of the oldest scientists still recognize the New Year, celebrated on the days of the winter solstice, December 22-23. With the Fire, Gentile Slavs were also associated with the emergence of people. According to some legends, the Gods created a Man and a Woman out of two sticks, between which the Fire flared up - the very first flame of love ..."
In Krasotynka near Kaluga is a Svarozic Fire temple complex reconstruction based on research devoted to the study of the pre-Christian rites of the Slavs of the 8th-13th centuries. Click here for more info. The complex also has a Fire Gate. https://ou.tsu.ru/school/natureslav/17.html: The "living fire" was extracted for ritual purposes by rubbing chocks and dry wood four times a year in accordance with the solar phases of the winter solstice and the stay of the sun (Kolyada), the spring equinox (Maslenitsa), the summer solstice (the Kupala days), the autumnal equinox (days Dazhdbog). The Orthodox Church once established the New Year's meeting on September 1. This day was called the "New Year", and the common people greeted him with the "burning fire"
In Latin Neid Fire is NedFri or Nedfres - I've found a few references to it in Latin texts but Google doesn't translate too well! I can't access it! It seems to have some good references too! IMG_0867 (1) from Timespan on Vimeo.